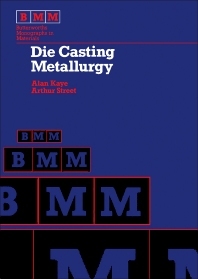 Die Casting Metallurgy focuses on developments in the metallurgy of die casting. Ore distribution, smelting methods, and energy requirements for the major non-ferrous metals that are die cast are considered. This text has 29 chapters; the first of which provides an overview of early developments in die casting. After explaining how metals and alloys are die cast, the book turns to the production of aluminum and its alloys, aluminum alloy die castings, and melting equipment for aluminum alloys. The chapters that follow explore the metallurgy of zinc and magnesium alloys; brass and ferrous die casting; automatic metal transfer systems; metal melting treatments; and the metallurgy of die casting machines. Developments in lubrication, die casting, and finishing processes are also considered. This book also describes pressure die casting dies, thermal fatigue of die casting dies, heat treatment of die steels, and surface treatment of steels. Some comparative alloy specifications are summarized and an attempt is made to correlate units of hardness, strength, and other properties. This book will be of interest to materials scientists and industrial materials engineers.